Sample ballots for the Nov. 6 General Election are available online, Sarasota County Supervisor of Elections Ron Turner announced on Oct. 1. Voters may go to SarasotaVotes.com, choose the “Precinct Finder” icon at the top of the homepage “and follow the easy instructions to view English and Spanish language versions of their personalized sample ballots,” a news release explains. Pursuant to a U.S. District Court order, Sarasota County is providing sample ballots in both English and Spanish by mail, in legal advertisements and in all polling locations, the release points out. All Sarasota County voters will have the opportunity to vote in races for U.S. senator, member of Congress, governor/lieutenant governor, attorney general, chief financial officer, commissioner of agriculture, state senator, Board of County Commissioners, Charter Review Board, and the Sarasota Memorial Hospital Board, the release points out. 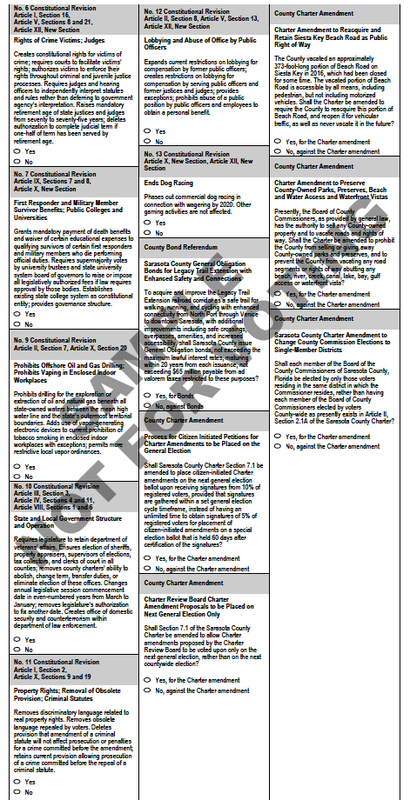 In addition, all voters will be able to cast ballots in judicial merit retention races involving the Florida Supreme Court and the 2ndDistrict Court of Appeal, and they will be able to make their decisions on a number of proposed Florida Constitution and Sarasota County Charter amendments, the release notes. Depending on their voting districts or municipalities, some voters also may have the opportunity to elect a state representative and local officials and “to weigh in on one of two municipal questions,” the release adds. Because of the recent death of the Democratic candidate in the Congressional District 17 race, the Democratic Party is entitled by law to select a replacement candidate by Oct. 2. However, it is too late to change the ballot, the news release explains. Therefore, if a replacement candidate has been named prior to the deadline, a vote in that contest for the Democratic candidate will be a vote for the named replacement candidate. A candidate in the race for Seat 2 of the Bobcat Trail Community Development District (Precinct 333 only) has withdrawn, resulting in an unopposed race. Therefore, a vote cast in this race will not change the outcome, as the remaining candidate is deemed by law to be elected. Proposed Constitutional Revision question No. 8 was removed from the ballot by the Florida Supreme Court. However, the numbers of the remaining proposed amendments will remain unchanged on the ballot. Finally, Turner said that the elections office early this month will be mailing a personalized sample ballot to every registered voter who has not requested a vote-by-mail ballot. For assistance or more information, voters may call 861-8600 or visit SarasotaVotes.com.